Electrical malfunctions in miscellaneous electronics and components (this could be anything from stereo speakers to cell phone chargers). Laptops overheating, especially on softer surfaces. TIP: Minimize risk by using a cooling pad or laptop stand on a non-flammable surface. Electrical blankets and heating pads. TIP: Use these on low settings and follow the recommended time limits. Light fixtures and lamps with the wrong bulb wattage or material placed on the lampshade. Older appliances. The wiring may be in poor condition and insulation may have deteriorated, making them more vulnerable to sparks. Dishwashers. 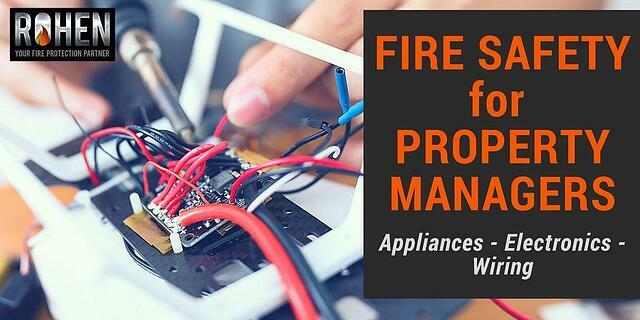 When water drips from a leaky dishwasher onto internal wires, a fire can result. Refrigerators and freezers. They may be cold, but their components can still catch fire. Dryers. Safety requires more than just emptying the lint filter. It's recommended that you also clean out your exhaust hose and dryer cabinet with a cleaning service every year. Additionally, plastic dryer vent hoses can be flammable and should be replaced with aluminum hoses. Here are the NFPA’s dryer safety tips. The general advice for appliances is to have a qualified party check them regularly, inspecting electrical cords, connectors, and outlets to be sure they are in good condition and not overloaded. If broken appliances are typically replaced with the lowest-cost used appliances you can find for your units, this step is even more important. Keep in mind that millions of appliances are recalled every year. Register the appliances used in your units (if you are responsible for them), and if you are responsible for older appliances that you cannot register, you can set up a Google alert for any recall notifications. Be cautious about new devices with extra bells and whistles. New technology brings new challenges. For example, microcomputers in appliances can pick up electromagnetic interference (EMI) from mobile digital devices and other sources if a suppressor is not installed. Otherwise, the signals could cause the appliance to turn itself on— even when the owner is not home (as occurred with a Magic Chef Whirlpool gas range in Brooklyn, New York in 2009). The Consumer Product Safety Commission has estimated that major appliances cause more than 150,000 residential fires each year, resulting in 3,670 injuries, 150 deaths, and $547 million dollars in property damage. They also found that while roughly half of these fires were attributable to human error, the other half appeared to be caused by problems with the appliances, such as microwaves that start up by themselves and keep going until they start a fire (Consumer Reports). Which appliances are most prone to catching fire? Ranges (44,708 fires; commonly caused by self-starting controls and being left unattended). Clothes dryers (13,723 fires; commonly caused by gas leaks and lint blockage). Microwave ovens (2,308 fires; commonly caused by running without food inside). Refrigerators (1,514 fires; commonly caused by light bulbs that don’t turn off and relay switch short circuits). Toasters and toaster ovens (1,335 fires; commonly caused by turning themselves on and getting jammed while toasting). Dishwashers (1,015 fires; commonly caused by control panel problems and liquid rinse-aid leaking into circuitry). Washing machines (657 fires; commonly caused by water leakage causing a circuit board fire). Don’t overlook the electrical wiring in your units. You may not have any idea who did the wiring, how competent they were, if they were licensed, or what standards they adhered to. That should give you pause. Faulty connections cause tens of thousands of house fires every year. In my experience, people are less conscious about the risk of fire from shoddy electrical wiring than they are about smoke detectors and the risk of fire from cooking. Make the units in your properties safer by using a licensed contractor to replace outdated wiring and install arc-fault circuit interrupters to detect electrical arcs before danger occurs. The Electrical Safety Foundation International (ESFI) is the best place to learn more about electrical safety. Finally, you can never have too many reminders to maintain all required working fire extinguishers, CO2 detectors, and smoke detectors in units. Make sure the expiration dates of fire safety devices are tracked (smoke detectors need to be replaced after ten years), and batteries are replaced regularly. If this is the tenant’s responsibility, you can help by posting reminders for them. Staying safe is everyone’s business. Get our smoke alarm maintenance template to help keep your smoke alarms working!